When it comes to making meals from spiralized fruit and vegetables, there is no shortage of options and it can be hard to know where to start. That’s where this list comes in. Here, we’ve rounded up some of the best spiralizer cookbooks available and we show you why each of these is worth considering for your own collection. There's a lot of book here in this list, so we'll start with our favorite: Inspiralized. 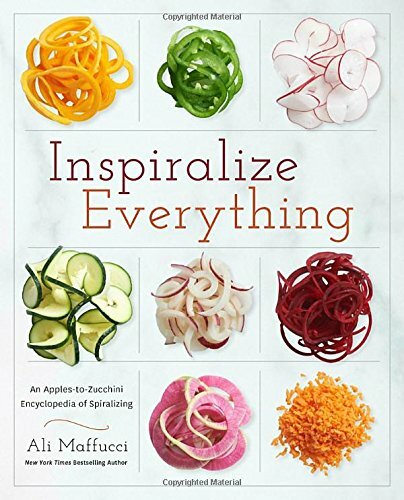 This cookbook managed to be a New York Times bestseller and has also played a key role in the popularity of spiralized vegetables. So then, what better place to start this list? The book itself covers spiralizing more than 20 different foods, along with the dishes that you can make. This doesn’t just include alternatives to pasta either. Instead, there are even recipes for ‘fries’ and for desserts that used spiralized ingredients. With all this in mind, if you had to get a single spiralizer cookbook, this would probably be the place to go. However, as is always the case, there are other options. In particular, many of the recipes in the book can be found on the website of the author. With that in mind, you might turn to one of the less common alternatives if you’re looking for inspiration or new recipes. = = > Get Inspiralized Here! This second option comes from the same author as Inspiralized but has a focus on a wider range of uses and types of dishes. Many of the recipes are also designed to be fast to make and cleanup, which is great for so many households. There is also no shortage of images in the book and this is perfect if you like using cookbooks as inspiration or guidance as you cook. One neat aspect is that the recipes are arranged based on what fruit or vegetables they use, rather than by type of meal. This organization approach is unusual but it could work well. In particular, the style makes it much easier to figure out which meals you can make with the ingredients you have at hand. = = > Get Inspiralize Everything Here! 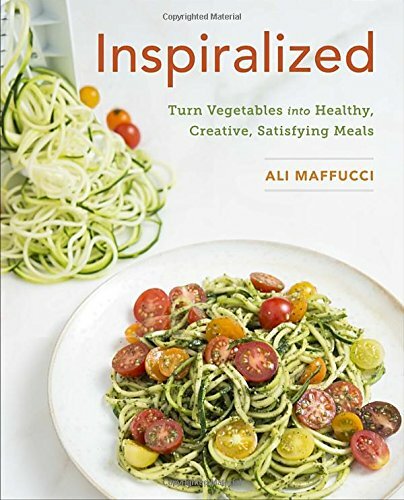 Unlike the previous examples, this cookbook focuses on one key use of spiralized vegetables – as an alternative to pasta or noodles. The idea makes sense, as this is the main reason that many people turn to spiralizing anyway. Plus, the process does serve as a great way to get more vegetables into your diet. 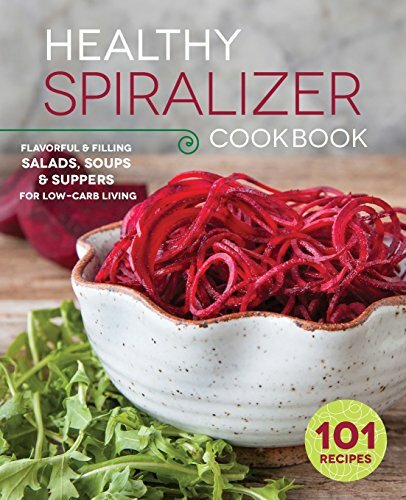 The book itself offers 75 different recipes, along with advice about which vegetables to use and which spiralizer models offer the best outcomes. The recipes are also dairy free and many of the recipes end up being paleo as a consequence. This style is likely to attract a range of people but could be surprising and disappointing for anybody not trying to avoid dairy. 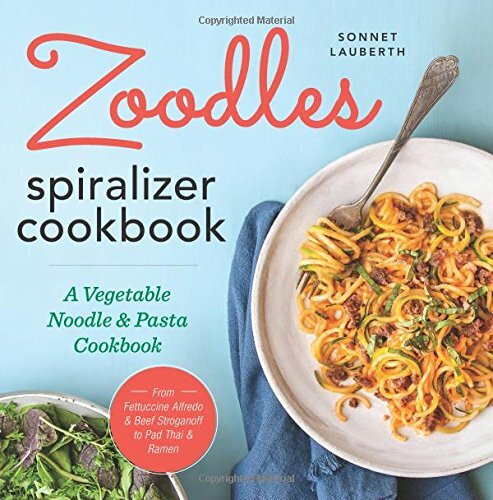 = = > Get Zoodles Spiralizer Cookbook Here! 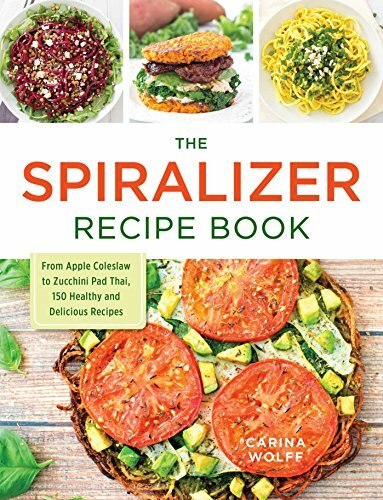 With 101 recipes, this cookbook is an impressive option if you’re looking for inspiration about spiralized meals. 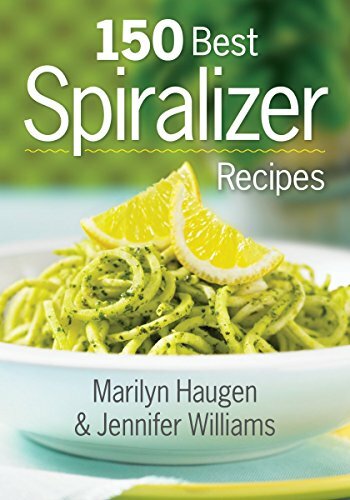 It is also another book that focuses on a range of additional information, including the various spiralizer products on the market. One especially interesting aspect is the use of recipe icons. These make it clear which type of spiralizer you need to use (hand-crank or hourglass), along with the type of blade and which diets the recipe is good for. That information isn’t as obvious in other cookbooks and can make the recipes easier to follow. 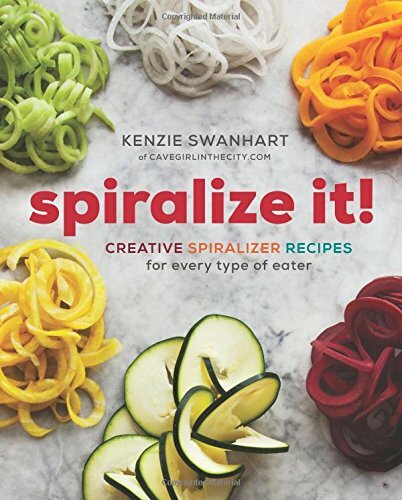 In many ways, this particular book acts as a better overall resource for spiralizing than the Inspiralized cookbook, even though this one is less well-known. The one catch is that many of the recipes don’t have images. Nevertheless, they are well presented and are easy to follow, despite that limitation. = = > Get Healthy Spiralizer Cookbook Here! In many ways, this cookbook is on the simple side and it isn’t as visually stunning as the previous options on this list. But, simple has its place in cooking, especially if you want recipes that are easy to follow. That aspect alone makes this book worth considering. Additionally, there are either 50 or 97 recipes on offer (depending on the version), so you’re likely to find at least some that are unusual or inspirational. = = > Get Spiralizer Recipes Here! This cookbook was designed with one specific spiralizer in mind but that doesn’t stop it from being useful. For that matter, the recipes could be made with pretty much any spiralizer with minimal adjustment. So, regardless of the specific product you have, this is an attractive cookbook to help you learn more about spiralizing vegetables and the meals that you can make. The one downside is that there aren’t many pictures and those that are present aren’t high quality. So, the book isn’t well suited for anybody who loves images with their cooking. Still, it does serve its purpose well, especially if you’re keen to learn some new dishes and techniques. 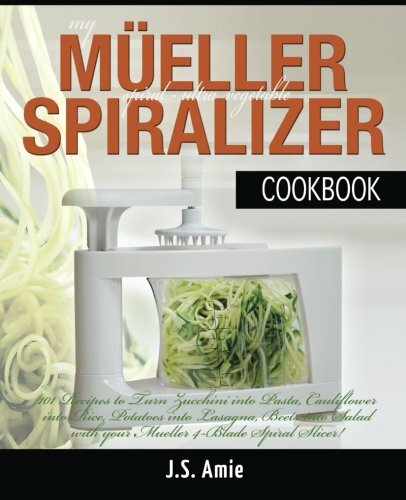 = = > Get My Mueller Vegetable Spiralizer Cookbook Here! Spiralize It! offers more than 100 recipes that are designed to suit a range of diets, including paleo, gluten-free and vegetarian. The recipes also cover a large area, including main meals, sides and desserts, making them suitable for many different situations. The one catch is that many of the recipes are on the basic side, especially if you have already been spiralizing food for a while. However, this style does make the book a good choice for anybody just getting started. At the same time, simple recipes often work well and many people would enjoy the finished dishes. = = > Get Spiralize It! Here! With 150 different recipes, this cookbook offers more ideas and inspiration than most. The recipes tend to be easy to follow, with users reporting that they consistently turn out well. There is also additional information about spiralizing and the tools that are used, along with individual sections for different diet types. The book does also offer images of finished dishes but only for some of them. This is likely to be fine for many people but it is worth considering if you are a strongly visual person. For that matter, the lack of images is why this book ends up being either loved or hated. Certainly, the information and recipes provided are effective but some people prefer books that are heavy on images. = = > Get 150 Best Spiralizer Recipes Here! This recipe book does tend towards more complicated meals, including some that use spiralized ingredients as one small component, rather than the main element of a dish. That overall style could be positive or negative, depending on what you’re looking for. More than anything, the recipes chosen mean that this cookbook would work well if you’re trying to expand your repertoire or used spiralized ingredients in regular dishes as well. On the other hand, the book may not be attractive if you’re wanting simple and easy to prepare meals. 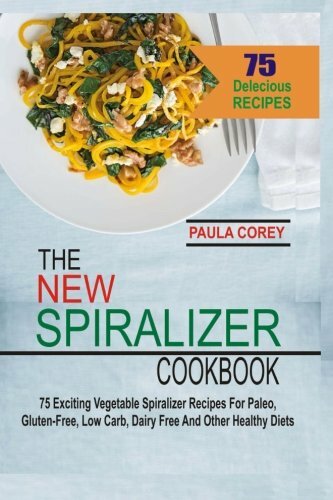 = = > Get The Spiralizer Recipe Book Here! Williams-Sonoma seems to have a cookbook for just about every topic imaginable and this is their entry into the world of spiralized tools. As cookbooks go, it is beautiful to look at and easy to use. The authors also offer information about how to use a spiralizer and the types of blades. Nevertheless, while the book is compelling it is also short. There are only around 20 different recipes present, which is fewer than most other spiralizer cookbooks. As such, this would work best as an introduction into the world of spiralized cooking, rather than an overall guide. 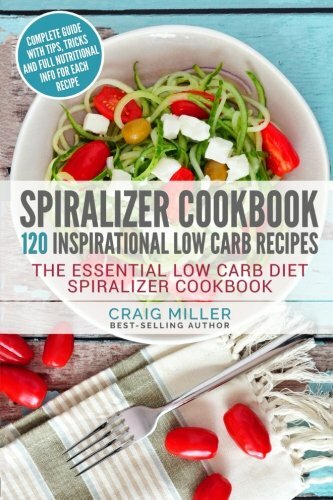 = = > Get Spiralizer 2.0 Cookbook Here! The low carb focus of this book is an important one. Many people turn to spiralizing to cut down on carbs, particularly because spiralized vegetables make such a good replacement for pasta. But, most cookbooks don’t specialize in this area. As a result, many of the recipes out there can be problematic for anybody on a low carb or a keto diet. This book offers a partial solution to that problem. I say partial because only some of the recipes are low carb. So, the book may be powerful for many people but you would still need to pay close attention to the nutrient profile of each recipe. 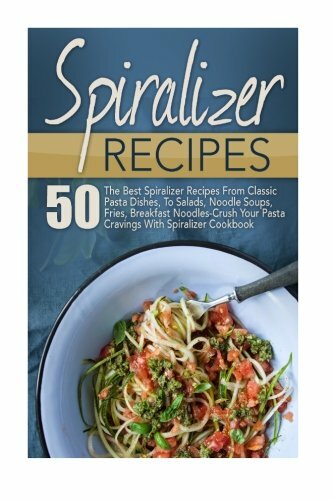 = = > Get Spiralizer Cookbook Here! This spiralizer cookbook is designed to offer recipes that work for a range of diet types, making it versatile. The recipes themselves vary, with some being simple and others being considerably more complex. However, this variation can be positive, as it means that you’re not stuck with the same boring recipes time and time again. While the recipes are good and seem to work well, the book itself may not appeal to everybody. For one thing, it is another option that uses relatively few images and the ones in the printed version are black and white. You could still follow the recipes without an issue but the style won’t appeal to everybody. 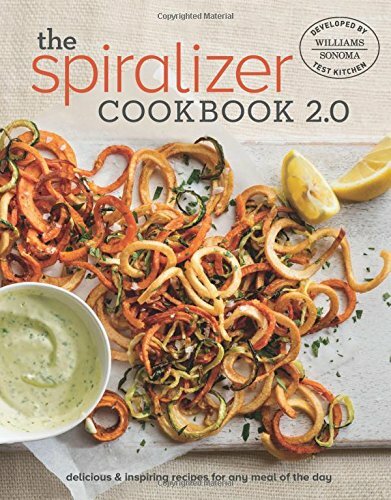 = = > Get The New Spiralizer Cookbook Here! 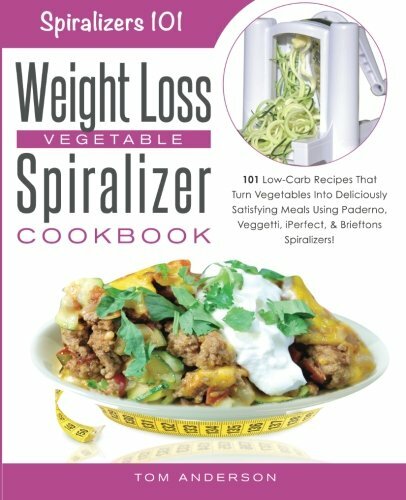 Realistically, most recipes that rely on a spiralizer are probably already good for weight loss but it’s nice to see a book that focuses on this area. The book itself is well-designed, with some information about effectively spiralizing vegetables and a discussion of spiralizing and weight loss. There are also pictures of the various concepts, making them easier to visualize and understand. The recipes themselves don’t have many images but they are well-formatted and simple to follow. Most also rely on common household ingredients or ones that are easily found. Finally, there is also nutritional information for each recipe, which is critical for anybody working on weight loss. = = > Get Weight Loss Vegetable Spiralizer Cookbook Here! This book comes from the same author as the one above, which should be evident from the style of their covers. Both books take roughly the same approaches, with the same general advantages and disadvantages. However, while the previous one was focused on weight loss, this one offers gluten-free recipes. As with the previous book, the style seems to work well and the recipes are appealing. Nevertheless, because of their similarities, it’s probably worth choosing one of the two books, rather than picking up both. 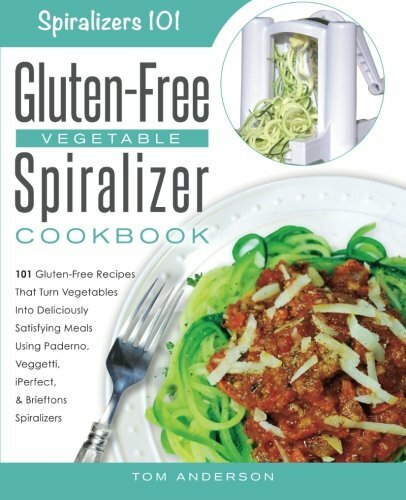 = = > Get Gluten Free Vegetable Spiralizer Here! Unlike most other options on this list, this cookbook is brand-specific. As a result, some of the information presented is designed for a Paderno spiralizer. Of course, you could still follow the recipes regardless, as the end results from different spiralizers are often very similar. Besides that, the book does also offer some information about using other types of spiralizers as well. The book offers more information than most, which could be a reason to choose it. The recipes are also appealing, although there is overlap between these and what other books offer. Despite these advantages, it is worth mentioning that the digital version of this book is probably better than the physical one. While the printed version does have a nicer design overall, it suffers from only being printed in black and white. This makes the images mostly useless and certainly doesn’t result in a very attractive book. 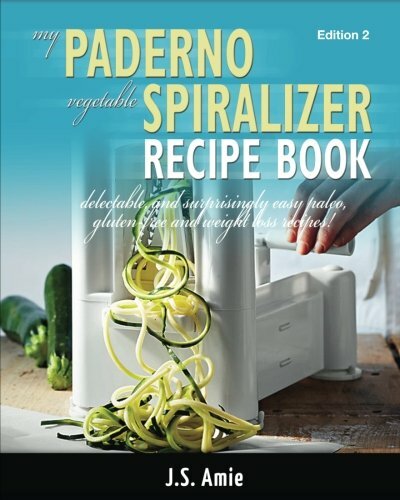 = = > Get My Paderno Spiralizer Vegetable Recipe Book Here! While there may not be an excessively large number of spiralizer cookbooks out there – this list shows that there are some high-quality ones to choose from. Realistically, most of the cookbooks here would work well for anybody who spiralizes regularly or is getting started. However, the cookbook that we recommend the most is Inspiralized. Inspiralized is probably the most well-known cookbook on this list but it has that reputation for a reason. It simply is an amazing resource, offering recipes across a range of styles. There are also many images to accompany the book, as well as advice about ways to spiralize effectively and to make dishes taste good. The combination of recipes, images and information make the book a great choice, regardless of your experience with spiralizing.